A sustainable solution that reflects and emits the sun’s solar radiation to provide a cooler surface. Dulux is committed to continually improving the environmental footprint and sustainability of their products. Infra COOL Technology reflects and emits both the visibile or “colored” light and invisible Infrared light which accounts for over 50% of the sun’s total light energy to provide a much cooler building surface. A cooler surface means less heat penetration resulting in cooler occupancy zones which lowers the use of energy- translating in cost savings and reduced associated greenhouse gas emissions. Sustainable building design and energy efficient living leads to environmentally responsible economic growth. Cool Roofs offer us one of our most simple and effective Global Warming mitigation strategies. Roof surfaces represent 20-25% of the built environ and act as “Solar Radiators” so much so that around 93% of the building’s HEAT GAIN can be attributed to radiant energy (meaning the sun’s rays converted to heat after absorption). 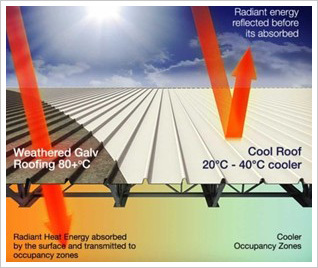 In Australia, where the prominent source of a buildings heat gain is Radiant Sunlight and up to 93% of a buildings heat gain in summer is attributable to radiant heat. 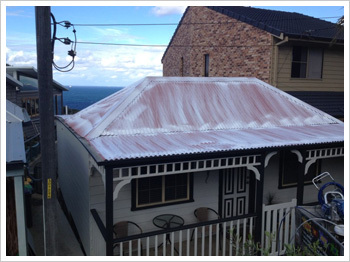 Reflective COOL Roofs should be a key focus in combating heat gain. 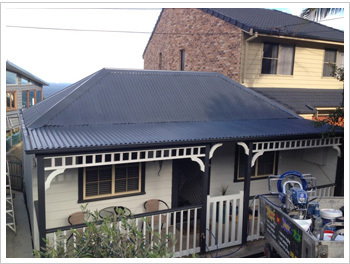 In Australia, most commercial buildings have Galvanised or Zincalume roofing which act as poor reflectors of solar energy. By reflecting more of the sun’s energy these surfaces can be 20-40°C COOLER translating into cooler occupancy zones, lowering cooling energy demand and thus delivery cost and energy emission savings.